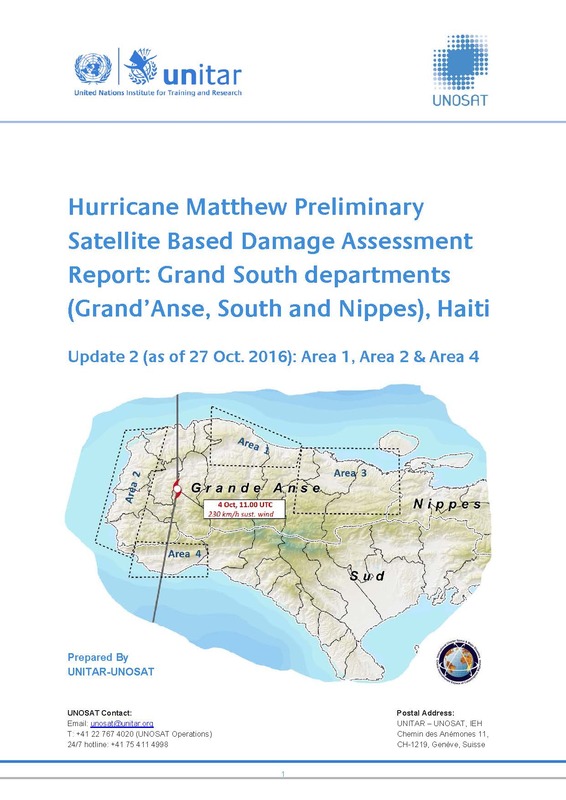 This report describes preliminary building damage analysis carried out by UNITAR-UNOSAT covering Area 1 (Jeremie and Roseaux Commune), Area 2 (Abricot, Dame-Marie, Anse d'Hainaults and Les Irois Communes), Area 3 (Corail, Pestel, Beaumont and Roseaux Communes), and Area 4 (Tiburon Commune) for a total area of approximately 1,200 Km2. Building damage analysis, including a rapid assessment of transportation network conditions and locations of spontaneous people gathering sites, was conducted by comparing the post-disaster satellite images (Pleiades acquired on 7/10/2016 for AOI1, Pleiades acquired on 12/10/2016 for AOI2, Pleiades acquired on 09/11/2016 for AOI3 and Worldview-2 acquired on 9/10/2016 & 17/10/2016 for AOI4) with available pre-disaster images (WorldView-1 on 08/12/2014, 01/05/2015, 09/05/2015 and 16/06/2015; Worldview-2 on 17/07/2016, 28/11/2014 and 14/06/2015 and Worldview-3 on 17/10/2015). UNOSAT's preliminary analysis shows a total of 40,696 buildings/structures with visible damages and approximately 508 locations with visible road obstacles and/or access constraints. In addition, 1,497 temporary people gathering sites have been identified within the analysed areas (Area 1, Area 2, Area 3 and Area 4).